Mars accepted a replica of Sammartino's championship belt from what was then known as the World Wide Wrestling Federation. Bruno Mars has met the man he's nicknamed after: former pro wrestling champion Bruno Sammartino. The two met Tuesday night when the pop singing sensation's "24K Magic World Tour" stopped in Pittsburgh. Sammartino heard through friends that Mars, born Peter Gene Hernandez, was nicknamed "Bruno" by his father because he was a "chunky" baby. The wrestling legend — now 81 — was about 275 pounds in his prime and the favorite wrestler of Mars' father. 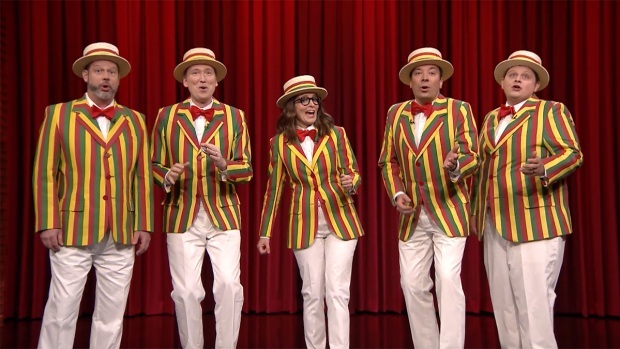 The Ragtime Gals sing a barbershop quartet version of Bruno Mars' "That's What I Like" with Tina Fey. Sammartino says he was "extremely impressed. ... He was the most humble, nicest guy. He couldn't have been more respectful." Mars accepted a replica of Sammartino's championship belt from what was then known as the World Wide Wrestling Federation. The promotion is now World Wrestling Entertainment, or WWE. Mars posted a picture of the meeting on Instagram.